It might be hot outside but did you know that most conventions and gamedays are held in temperature controlled environments? It's true! This is particularly helpful for us gamers who often have an aversion to sunlight and fresh air, especially when combined with physical exertion. There's nothing I personally like better after a strenuous walk or escalator ride than a sit-down and a chance to do a funny voice while pretending to be some shopkeeper or other. Even if you are one of the healthier specimens of the gamer species, a chance to have a concentrated dose of gaming might well be appealing to you, so take heed of what I have gathered here below. Just to be sure it gets some attention right up front, don't forget that Gen Con Indy is toward the early half of August, from the 14th through the 17th. There will be lots of Pathfinder and D&D 5E events, to be sure, but more than 50K people are likely to be there this year, so expect big things. They've pretty much taken over the entire, sprawling convention center at this point, so bring plenty of water and possibly a ranger-guide for those hikes between games. If I go, it will likely be a last minute decision but I promise to run some 1E for my OSG friends and hope to drag along an old wargame and some miniature battle game of some sort or another. This week sees my regular RPG group jumping into the D&D 5E Starter Set. We're taking a break from a 1E AD&D campaign to which we will return post-Gen Con. Midday on Tuesdays still often finds me at Taco Bell for an hour or so of card shuffling, dice gaming, or meeple moving. 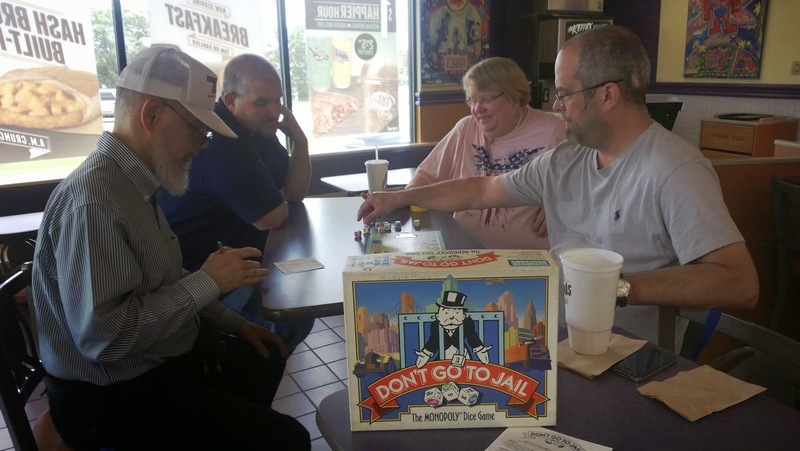 Yesterday, for instance, we had several games of Don't Go to Jail (1991), the original name for Monopoly Express, a Monopoly-themed/based dice game. So, too, Friday finds that same gang and more over at Culver's from 11 am onward into the afternoon. If folks don't have pressing appointments, we might game until 3 pm or later. Stop on by if you're in the area. The third weekend of the month sees two local gamedays, for me in Lake Geneva, WI, with Saturday, July 19th, being time to meet again in the little church in Burlington, WI, and make some gamer noises. It's a wonderful space in which to play and the folks there are always friendly and welcoming. Get more details and join them by signing up for their Facebook event here. On Sunday, July 20th, of that same weekend, join the S.L.A.G. (Southern Lakes Area Gamers) members at their monthly Gathering of Gamers at the Pizza Ranch in Elkhorn, WI. Doors open at 11 am with gaming beginning around 11:30 am after the first round of buffet devouring (I go with the fried chicken!). This event often lasts until 8 pm-ish. You'll need to join the S.L.A.G. group on Facebook to see the event listing but you can do so here. Don't forget to bring $12 for the buffet and unlimited beverages. **ALERT(S)** DEXCON 17 begins today, July 2nd and runs through July 6th, at the Morristown Hyatt & Conference Center in Morristown, New Jersey. They'll be featuring the premiere of OSWARP, the Old School Wargaming and Role Playing Mini-Convention, a convention within a convention, catering to Old School gaming interests. Also, the Dice Tower Convention begins today in Orlando, FL, and runs from July 2nd through 6th, five days of gaming for this one! And while on the subject of this weekend, the DoubleTree Hilton in Bloomington, MN, hosts Convergence this weekend, July 3-6, 2014. Salt Lake City is hosting both WesterCon and Fantasy Con, July 3-5, and more information on them can be had here. July 4th and 5th sees CosmicCon happening at the Roswell Mall in NM. And, PaizoCon is happening July 4 - 6 in Seattle, WA. My apologies that this alert/notice doesn't give folks much time to plan. In the future I will try to mention the earlier events during any notifications in the previous month as well. I'll also plan to get the August update in before the end of July to give a bit more time to make arrangements. Continuing with this month, July 10-13, the Connecticut Convention Center in Hartford, CT, is host to ConnectiCon. Milwaukee Summer Revel runs July 11-13 at the Sheraton Milwaukee Brookfield Hotel. KantCon 2014 takes place at the Overland Park Convention Center July 18-20 and more info is available here. In Scottsdale Arizona, the Seventh Annual T&T Convention (Tunnels & Trolls) will be July 18-20 from the good folks at Flying Buffalo.. In Glen Burnie, MD, Charm City is a fine RPG gameday for the DC/Baltimore area on July 19th. Also, July 18-20, there is QuinCon held at the Quincy Senior and Family Resource Center at 6th & York St. in Quincy, IL. In Tomahawk, WI, Russell Lawrence is running his second annual Mid-Summer Gameday in Tomahawk, WI. Toward the end of the month, July 24-27, the San Diego Convention Center will be crawling with our nerdy siblings for the Intl Comic-Con 2014. I have yet to make it to one of these monstrosities but have no doubt it would be a blast. Saturday, July 26th, is CapCon, which includes historical games, fantasy games, card and boardgames, and runs from 9 am to 6 pm, raising funds for the Springfield High School World War II Memorial Scholarship Fund. The Conclave of Gamers happens July 25th to 27th at the Denver, CO, Crowne Plaza. Also from the 25th to 27th of July, in Nashua, NH, the OGC (Open Game Convention) will be held at the Courtyard by Marriott Hotel. In coming months, beyond July . . . In August, in addition to Gen Con Indy, Shore Leave 36 is happening August 1-3 in Maryland and more details can be found here. Look toward Dragon Flight XXXV taking place August 8-10 at the Bellevue Hilton near Seattle, WA. Fan Expo Canada takes place August 28-31 at the Metro Toronto Convention Centre. At the end of the month, Pax Prime takes place from Aug 29 through Sept 1st in Seattle, WA. That final weekend of August, the 29th through September 1st, Atlanta hosts DragonCon, one of the major gaming conventions I have yet to attend but have on my short list. In September, the 39th EN World Chicago Gameday, three happen each year, will take place in Mount Prospect, IL, at the excellent Games Plus gamestore on September 13th, mostly RPGing but sometimes other gaming types. September 12 through the 14th at the Masonic Lodge No. 43 in Lancaster, PA, check out Save Against Fear, a fundraising for which there are details here. The Boston Festival of Indie Games takes place on Sept 13 from 10 am to 8 pm in Cambradge, MA. September 20th, at the Newport Centre, in Newport, Wales, UK, the Dragondaze (one-day) Games Convention raises money for Barnardos Young Carers. September 19th through 21st, at the Buffalo Niagara Convention Center, hosts the Queen City Conquest. Also, remember, you can visit the Fall Gaming Hoopla for lots of boardgaming action and more (RPGs, Card Games, Etc. ), from Sept 26-28, at the Johnstown Community Center, in Janesville, WI, with more information on their Facebook event here. In October, there's Con on the Cob, on the 16th through the 19th in Hudson, Ohio, "a Four Day Celebration of Games, Art, Freaks, & Fun!". Then in November, check out U-Con in Ann Arbor, MI, and GameHole Con in Madison, WI. And don't forget the HavenCon Games Day being held at the Urbana Volunteer Fire Department Banquet Hall in Frederick, MD, Saturday, November 15, from 10 am to 10 pm. November 7-9 at the Killington Grand Resort, Canage on the Mountain present A Fist Full of Carnage. Some of this information is gleaned from the excellent lists (which you can check for even more event information!) on upcomingcons.com/gaming-conventions, GameConventionCentral.com, HMGS (the Historical Miniatures Gaming Society), and as well as many, many gamers on Facebook and Google Plus I am lucky to be in contact with. Thanks to all who helped assemble this collection!